PLEASE use these features with caution and remember, there is NO UNDO. To edit a single activity, find the activity in the Activities Calendar or List view, click the activity, make the appropriate changes, and click Save. To edit multiple activities in Time2Track, you will use the bulk editing tool. Go to the Activities List view, then use the filtering options to find the activities you'd like to change. Select the appropriate activities from the list (or click the top checkbox to select all the activities on the page), then choose an option under the Choose bulk action dropdown list. 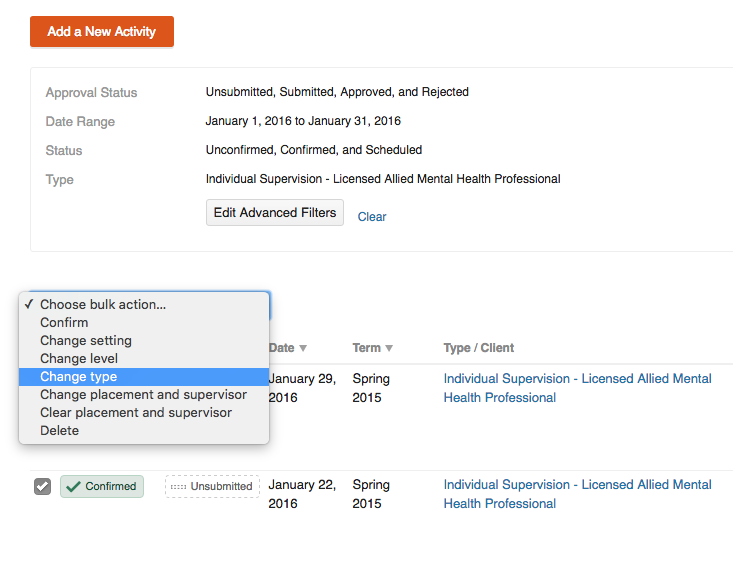 You can change the Setting, Level, Type, or Placement and Supervisor for a group of activities. 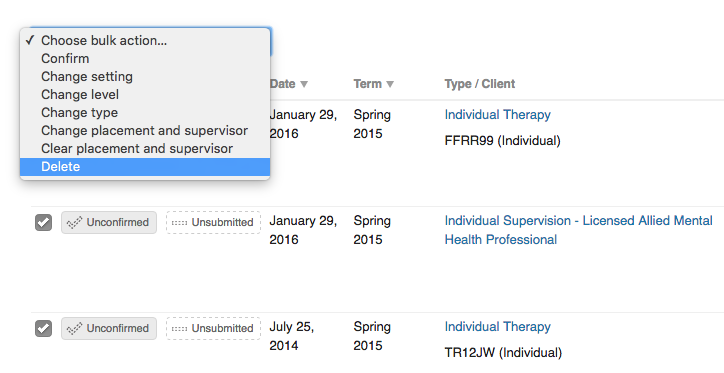 You can also choose Clear placement and supervisor if this option is needed. Next, follow the prompts to make your changes to the activities. Note: Only one page of activities can be edited at a time so make sure to follow the steps above for each page on your list. In order to edit a group of activities using the bulk editing tool, they must all have the same option listed for what you want to change. For example, if you want to change the Level of a group of activities, they must all have the same level to begin with. An easy way to check for this is to use Advanced Filters. Navigate to the day the activity occurred in the Activities Calendar view. Move your cursor over the activity, click the X button, then click Delete this activity. Remember, there is NO UNDO. At some point you might have a need to delete multiple activities at one time. This should be done sparingly, as it increases your risk of deleting activities by mistake (which cannot be undone). PLEASE use this feature with caution. The last thing we would want you to do is accidentally delete all your activities. If you are moving on to another level of training (eg. Internship or Postgraduate), DO NOT delete all your activities in order to start over. Instead, change your level to categorize your activities appropriately. To delete multiple activities, you will use Time2Track's bulk editing tool. Go to the Activities List view, then use the filtering options to find the activities you'd like to delete. Select the appropriate activities from the list (or click the top checkbox to select all the activities on the page), then choose Delete under the Choose bulk action dropdown list. Click Yes, Delete when prompted, and your activities will be permanently deleted. Remember, there is NO UNDO.